The original recipe (from a 1961 issue of Gourmet magazine) specifies cold rice, but I like the fritters’ texture better if the rice hasn’t been refrigerated. I've made a couple of other changes, too, adding sugar, vanilla, and cinnamon, increasing the raisins and almond quantities, toasting the almonds, and substituting slivered nuts for chopped (were slivered even around in 1961?). Apricot jam is the suggested accompaniment, but I think you can spread your wings a bit and use any jam you have on hand. I served them with Five Grapefruit Marmalade by Robert Lambert, a score from an Oakland, California, farmers' market, which was terrific. After cooking the first batch, the pan will be plenty hot so you’ll probably have to adjust the heat to avoid scorching the butter in the second batch. Preheat the oven to 250 degrees and set the rack in the middle position. Stir the sugar and zest in a medium bowl until the sugar is moist and fragrant. Beat in the eggs and vanilla. Add the rice, flour, cinnamon, almonds, raisins, and a pinch of salt, and mix well. Melt 1½ Tbsp. butter in a medium nonstick skillet over medium-high heat. When the butter stops foaming, scoop about ⅓ cup rice batter into the pan to form about a 3-inch round; working quickly, repeat to form three or four more rounds, leaving at least 1 inch between them. Cook, undisturbed, until the rounds are golden brown on the bottom, about 2½ minutes. Flip the rounds carefully with a heatsafe- and nonstick-safe spatula and cook, undisturbed, until the second side is golden brown, 2 to 3 minutes longer (adjust the heat if the butter begins to scorch). Remove the fritters to paper-towel-lined plates and keep warm in the oven. Wipe the pan with paper towels, return it to medium heat, and repeat with the remaining butter and batter to cook the rest of the fritters. 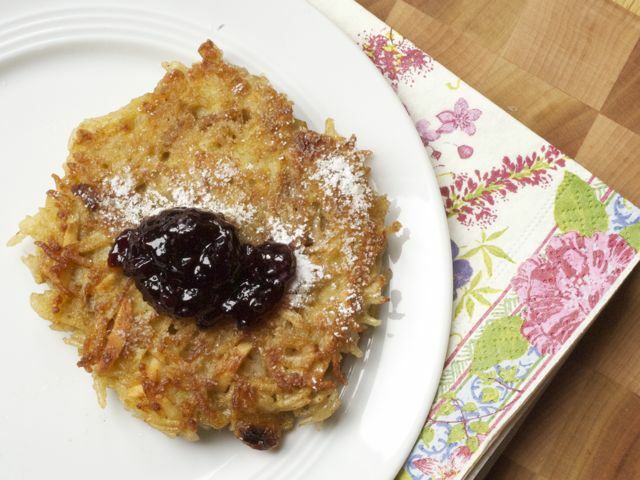 As soon as the last fritters are cooked, dust them all with confectioners' sugar and serve immediately with jam.